Playing drum solos is one of the first great challenges a jazz drummer faces in his/her career. Keeping the audience hooked to a long drum solo is definitely not easy. Many times I see young drummers shredding on the drums with a bunch of licks and great technique, but with no content and no depth. The first two elements are the ones I feel we lack the most when we are coming up as students. They are the hardest to develop. It’s so easy to rush and throw all your licks at once with no organization whatsoever, and no motif or melodic idea to hold everything together. 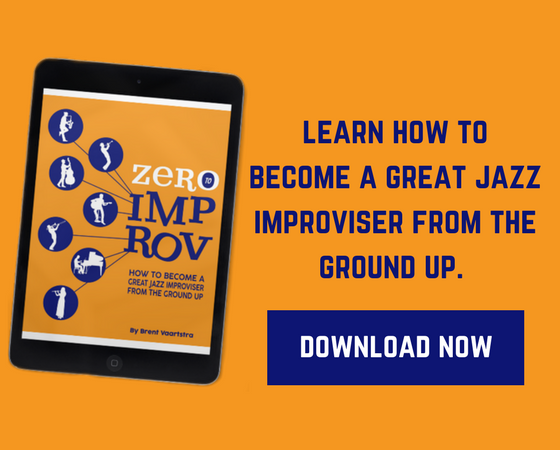 When I faced this problem, I came up with a fun system to help myself overcome my soloing deficiencies. 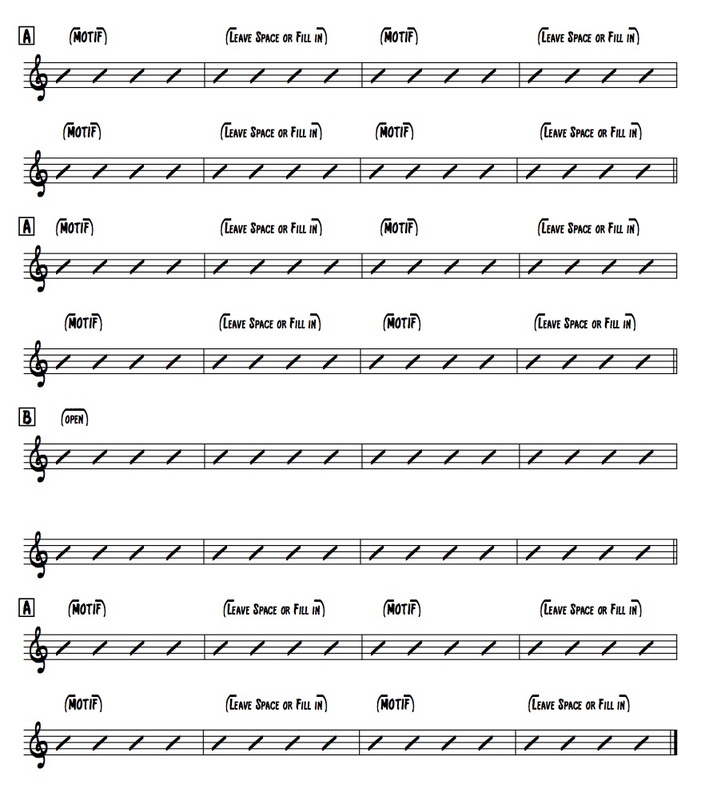 We are going to work on one of the most common jazz tune’s forms there is. It is an AABA 32 bars form. 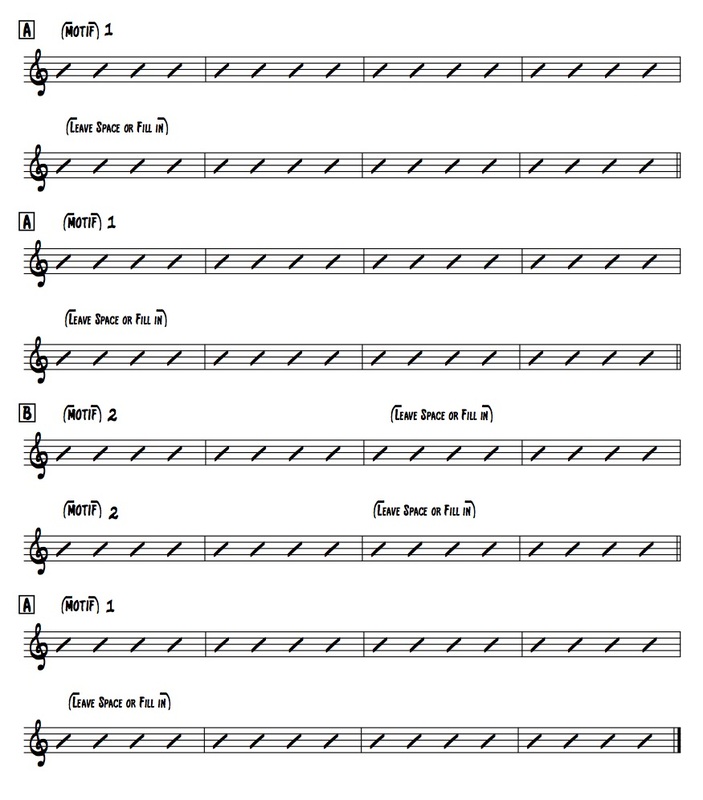 Rhythm changes and many tunes from the American song book are written in that standard form. So we better get used to improvising over it. Now that we have established the form in which we are going to be working on, we’ll start by setting up some rules in order to force ourselves to develop motivic ideas, to leave space and be 100% conscious of our choices when we solo. First, let’s work on motivic development. For this one, I came up with the idea of placing a one-bar motif in different parts of the form and then work my way to those targets by leaving space or filling in between. Sometimes I use motifs in one section of the tune and leave other sections open to improvising freely. Of course, we can change the motif’s place to anywhere we want. Just make sure it is musical and makes sense. Also, notice in the video that you can vary the motif, for instance, I changed the orchestration on the bar 5 of each A section to give it more melodic movement. You can also insert larger motifs, like two or four bars motifs. Remember, as you get used to the form and phrases you can also vary the motif as a way of developing your melodic ideas and add more motifs, just like I did in the video: I add a second motif in the B section. 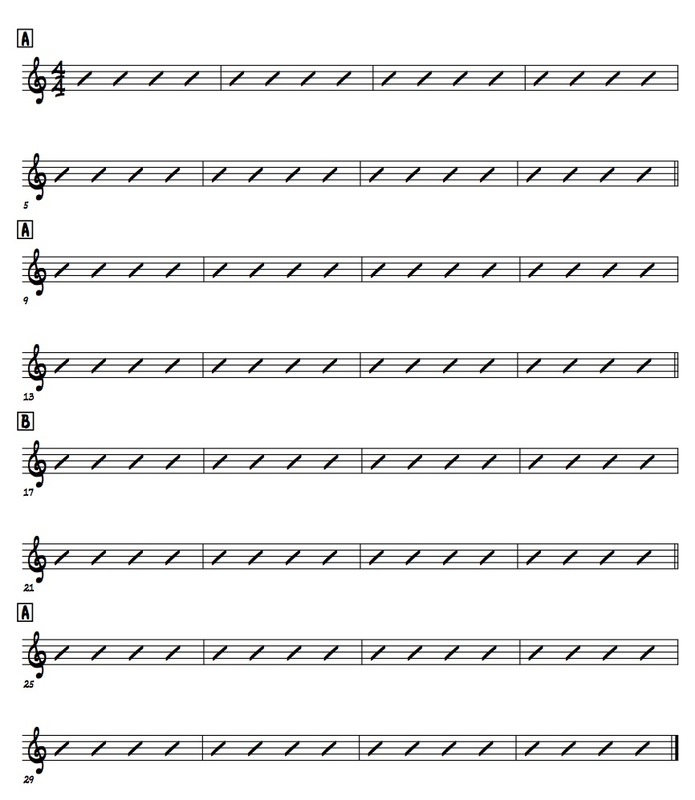 A long motif may be hard to memorize, however, first try repeating a short motif and re-orchestrating it, or play an open groove (a groove can also be a motif). In this video, I’m using a triplet base short phrase and repeating it 4 times on the A sections to create a four bar motif. The B section is open to free improvisation. 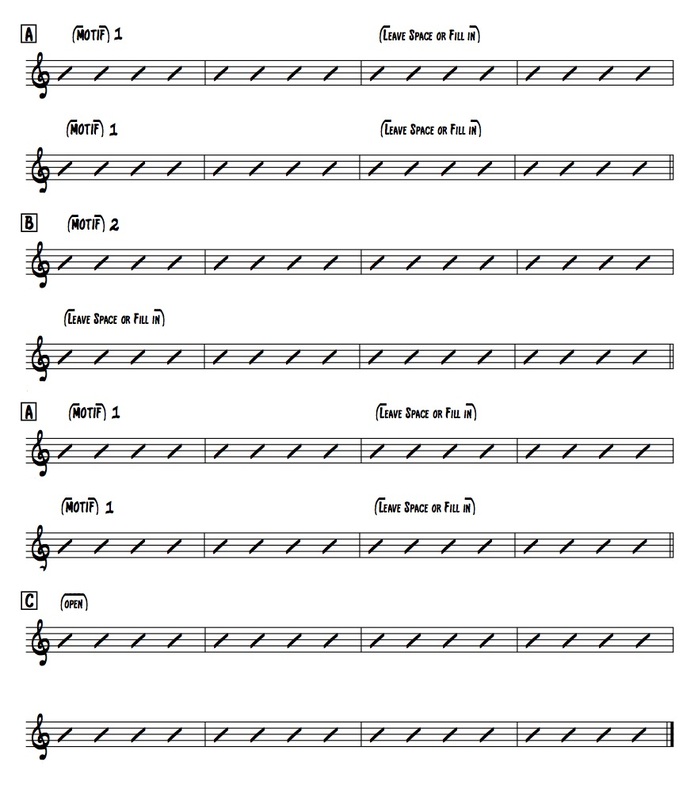 In one of my previous lessons, How to Get The Most Out Of Your Drum Solo Transcriptions Part 2, I worked on a few motifs from a Philly Joe Jones’ solo and I gave out ideas on how to develop them. Make sure you check that lesson and maybe you would like to apply some of those motifs here. So, now that we know how this works, we can use the same concept on other common song forms like the 12-Bar Blues and the 32-Bar ABAC. Try them out, and use the examples as templates to work on your own ideas. But remember you can always change the motifs’ place or length, you can develop or vary them through the solo, and/or add more than one motif to the mix. Really, the possibilities are endless. Obviously, this is not the only way to go around drum solos. This is just a basic concept to start organizing your ideas and get comfortable playing solos over long forms. Nevertheless, as you gain confidence playing over this, you’ll notice that you are going to start playing more advanced motifs, or polyrhythmic ideas. Keep it simple at first and be patient. 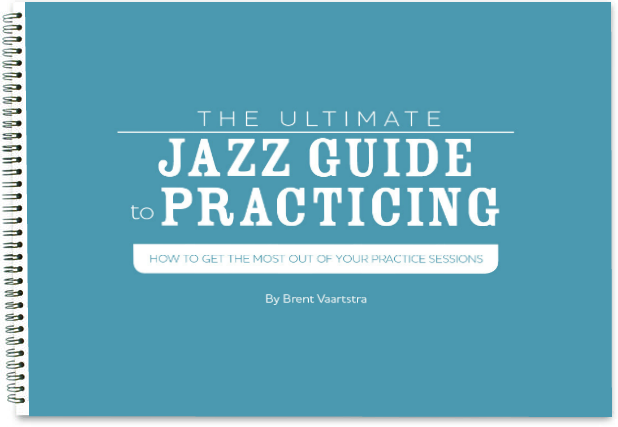 You’ll see your soloing skills growing more and more sooner than you expect. There are different styles and approaches to soloing. But I’ll talk about those in future lessons. Hope this was useful, and remember, if you want to ask me any question please direct message me at my Instagram or Facebook pages or just leave a comment. Thanks for this article (and video samples!). Hope to see you play live one day. Diego, thank you só muchas for this valuable lesson! You are a great drummer and teacher! Diego, I like your work… However, on #3,comp like Elvin, it sounds to me like you are actually playing 16th notes – cymbal, two 16th and bass hit, etc.- sounds like groups of four sixteenths.? 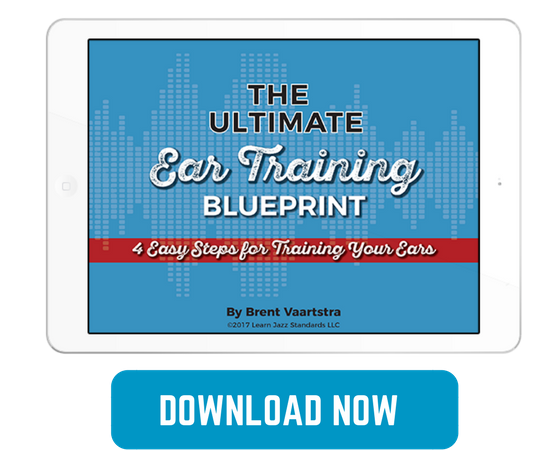 the pattern you have written here is eighth-note triplets – with the middle partial subdivided into two 16th. This would produce a different sound/rhythm than the sound bite you played. Am I mistaken? You are a very great and musical drummer! Thank you, I appreciate your comment, and I'm glad you find it useful for improving your drumming.